409 S Perry St, Titusville, PA.
train travel and relive history. See a variety of wildlife from groundhogs to bald eagles, with ducks, deer, and blue heron, as well as the occasional black bear. Be sure to visit our Museum, Gift Shop & Concession Stand at Perry Street Station, open any day we have train ride scheduled. Remember to visit our Concessions at Rynd Farm Station (halfway point) for ice cream, open June through October only. to order your tickets early. book - you can mail a postcard or letter right on the train. Snack and beverages are also available on the RPO car, as well as at our Perry Street Station and Rynd Farm Station. Check out our regular schedule and our special events. We are handicapped accessible. All of our stations have floor-level boarding platforms and wheelchair ramps. Wheelchair/scooter seating is limited to six on our Railway Post Office Car, with one attendant. Please note: due to limited space on the RPO car, only one attendant per wheelchair/scooter will be permitted. Since space is limited, advanced reservations are required. 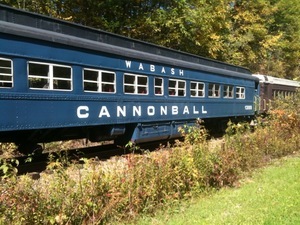 Our passenger cars are vintage equipment and cannot accommodate wheelchairs or scooters. Murder Mystery dinners and some special events are not wheelchair accessible. The OC&T is a 501(c)3 non-profit organization. train ride due to circumstances beyond our control. or inquire when you ride. We honored our 750,000 passenger on July 28, 2018. Congrats to James Miller & Family.